It’s a cookie within a cookie!! Please excuse my excitement over this cookie inception, but when tasked with developing a unique twist on classic hamantaschen for Purim, I wanted to go where no nice Jewish boy has gone before: stuffing them with chocolate chip cookie dough. For those of you who are unfamiliar, these are tender triangle-shaped shortbread cookies traditionally stuffed with ground poppy seeds or fruit preserves. You can go ahead and put that jar of raspberry jam away, since we’re not going to need fruit where we’re going with these bad boys. I spent a great deal of time testing this recipe to give the best possible cookie experience! For those who stan a warm, chewy chocolate chip cookie, you know bake time is crucial for that perfect texture. The issue I found with stuffing them into another cookie dough is that by the time the shortbread was golden, the center was baked more than I like for a gooey cookie. The solution? Just cut the flour in half to mimic that molten center even with a longer bake time. Then, just be sure you pinch the hell out the corners so they don’t open and you’re good to go! That being said, this is the perfect time to tell you to play around stuffing this hamantaschen dough with whatever you like. Nutella? Decadent and delicious! Leftover pie filling or jam? Do it! Any other cookie dough in your fridge that you suspiciously haven’t eaten? YAASSS. You’re going to be noshin’ on ‘taschen long after Purim is over! Make the filling: Preheat oven to 350°F and line two baking sheets with parchment paper. In a medium bowl, whisk together flour and salt. In a stand mixer fitted with paddle attachment, cream butter with sugars until light and fluffy, 2 minutes. With motor running, add egg, scraping the sides of the bowl as needed. Add vanilla and mix to incorporate. Add dry ingredients and mix slowly until a smooth dough forms. Remove the bowl from mixer and fold in both chocolates with a spatula. Make hamantaschen dough: In a medium bowl, whisk flour and salt to incorporate. In a stand mixer fitted with paddle attachment, cream butter and sugar until light and fluffy, about 2 minutes. With motor running, add vanilla and egg, then mix to incorporate. Add dry ingredients and mix on low until a smooth dough forms. Place dough between 2 sheets of parchment paper and roll out to ¼-inch thick. Using a 3¼-inch ring cutter, cut out as many rounds as you can. Spoon 1 tablespoon filling into the center of each circle of dough. Fold in dough from three sides to form a triangle and pinch edges together to seal, leaving a small opening over filling. Reroll dough scraps and repeat the process to form as many hamantaschen as you can. Divide hamantaschen between prepared sheet pans, spacing them 2-inches apart from each other. Chill for 1 hour, then repinch corners to ensure they’re well sealed. Bake the cookies, rotating trays halfway through, until the bottoms and corners are golden, 20 to 25 minutes. Meanwhile, prepare the drizzle: In a small bowl, stir melted chocolate and coconut oil until oil is melted and incorporated. 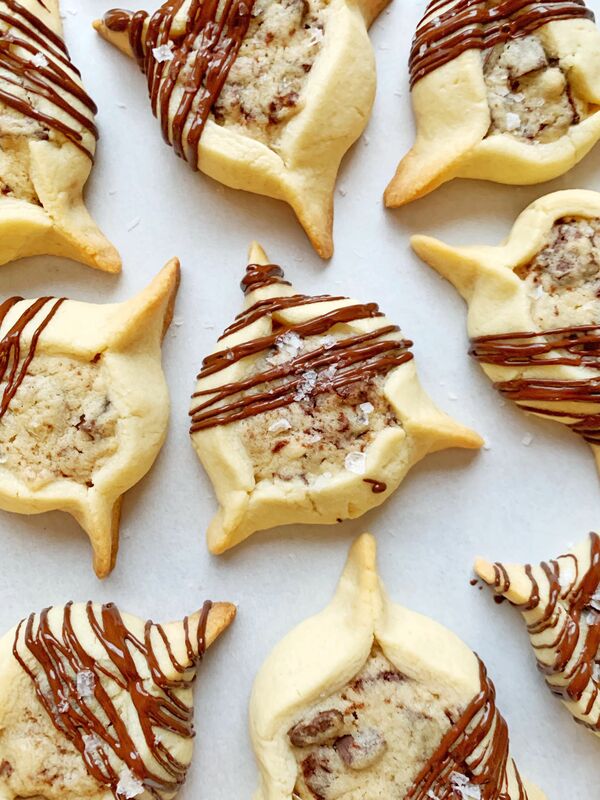 Let cookies cool slightly, then drizzle with chocolate mixture and garnish with flaky sea salt, then serve.